March available!! !Watch the whales on us! Beautiful luxury beach condo!! !! Newly decorated.The Harbor House ...beside heated pool ocean view too!!. This condominium, in the Harbour House is ocean view in Dana Point, Orange County is located just across from the public beach access to the Steps to Stand Beach. It is a pool-side, two-bedroom unit with accommodations for four or five. It has a king, queen an additional family room with French doors. The unit has been professionally decorated. The furnishings combine gorgeous pine, teak, marble, and glass with a color scheme focusing on natural sands and sea shades. You step from the front porch and there is a beautiful ocean view. The ocean is also viable (peek a boo view from Family Room) from the family room. This unit is approximately 1250 square feet, has an outside entrance, and is located on the ground level. Sitting atop of the Famous Dana Point Headlands, you will enjoy the smell of the sea air, with nothing between you and the ocean except eucalyptus and palm trees. Public beach access to the private and secluded STRANDS BEACH is via stairs in the County Park directly across the street. From the family room and front porch great ocean view for you to enjoy. The beach is the same beach the guests at the Ritz Carlton and St. Regis guests use just down the street. The master bedroom offers a private bath with double sinks, a luxurious king-size bed, and a private patio overlooking the pool. The guest bedroom has a queen-size bed, and has access to he main bath bedroom has a nice TV. The modern, light and bright, completely-equipped kitchen adjoins an elegant dining room with seating for six and a private patio area as well. A separate den with French doors for privacy, has a big-screen TV and a giant down-stuffed sectional for the ultimate relaxation experience. The entire condominium has white-wood plantation shutters. 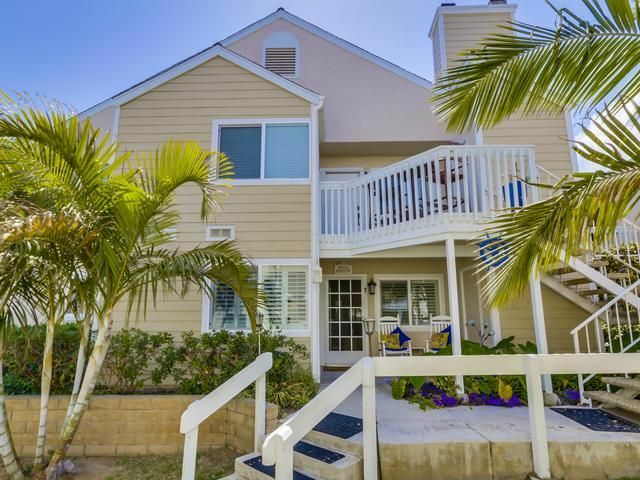 This condominium, the Harbour House is ocean view in Dana Point, Orange County is located just across from the public beach access to the Steps to Stand Beach. It is a pool-side, two-bedroom unit with accommodations for four or five. It has a king, queen an additional family room with French doors. The unit has been professionally decorated. The furnishings combine gorgeous pine, teak, marble, and glass with a color scheme focusing on natural sands and sea shades. You step from the front porch and there is a beautiful ocean view. The ocean is also viable (peek a boo) from the family room. This unit is approximately 1250 square feet, has an outside entrance, and is located on the ground level. The Unique Benifits of The Harbour House is the location. On one side is the pool and on the other side is the ocean just a few steps away across the street you can walk over a few steps and enjoy from that condo. We are just across from three lookout points. (1) There is a public access entrances directly across from the condo ( 2) beautiful walking trails and pathways to Strand Beach just steps away ( 3) trails around and on the Headlands from walking the sidewalk up Selva Rd. and then you can walk all around around the ocean from this trails at the top of Selva Rd. . . There is a variety of animals in this area that you may spot on your walk. The wonderful views of the ocean and the beach is breathtaking. We also have a Funicular, the only one in Orange County which is now in operation and free in summer and open only weekends in winter. . It will take you down close to the beach but you still have about 50 feet to walk to the sand. . Who can resist a beautiful condo with salt air to breath, fog horns blowing plus seals barking on the beach? You can even watch the whales swim by across from the condo. There are picnic tables waiting for you directly across from so just come and watch the sunset. A perfect place for any family. Our most unique benefit is our funicular which is similar to a ski lift that will take you to the beach fast and bring you back up from the beach or you can walk up and down our new steps, if you are a excercise buff. The funicular carries eight passengers at one time to the beach.. It is now in operation to the public free all summer but only works on weekends in the winter.. The beautiful walkway is a dream for any family to enjoy and view the sunset around 5 each evening straight across from the condo. It can be breathtaking. The walking path across the street is great for your walking trial any time of the day. People drive here just to use that walking trail from all over Dana Point and Laguna Beach too. . This condo has two complete bathrooms. Each provide showers, and one bathroom has shower plus tub. We are just steps from Salt Creek Beach and The Strand Beach. We also have a funicular that takes you down most of the way to the sand. It is free and works all summer and on weekends in the winter. When you walk on the beach Beach not far at all you can view Monarch Beach Golf Course.. close to the Ritz Carlton 1 1/2 blocks from our condo. .. Walk out the front door and on the front porch then you can see the ocean across the street the beach is visible . Walking trails across street. Just walk across the street and down the steps and you are at Strand Beach /Salt Creek beach , the most perfect beach in Orange county. Yes not only do you have water view from front of condo and we are also beside the heated pool which is very convenient. 600 Thread Count We have several sets of linens and you will be very comfortable. . I provide two reserved covered parking spots for you. If you need more let me know and I will arrange for that. .
Two covered parking spots that will be reserved for you. Beach Towels and plenty of towels. This condo has a family room with French Doors plus a living room with fireplace. Two beautiful seating areas for your comfort.. That is what really makes this condo extra special for our guests. A nice stove for those that love to entertain and cook for their fmaily. Enough dishes for a small army! Everything you will need is here. Just like your kitchen, a home away from home. Dinning tale for six. You will be able to fix your family a special dinner of your choice. The dining table has six chairs and we provide everything you will need from the kitchen for your meals. Three large flat screens TV's with HD and cable for each condo. Lots of videos. Do you like Clint Eastwood. many of those videso and others too. This is provided at the Dana Point Harbour close by to the condo. Boogie boards and beach towels are provided. Several Tennis courts in the area. Yes and this pool is heated year round for your enjoyment. The hot tube is open fro 8 AM to 10 PM and beisde this condo. Cox Fast Internet Connection WIFI provided , Lap Top Computer provided for your search or your e-mail use,located beside pool and hot tub. Sorry, no Smoking or pets allowed. We try to provide a very clean and comfortable condo for your enjoyment.